Tonight on Hannity -- a world-exclusive, the first televised interview with Thomas Jefferson, third President of the United States. Hannity: Sir, thank you so much for meeting with us. It's a unique honor and privilege. Jefferson: You're welcome, young man. Your industrious society has created many marvels worthy of the American people. Hannity: Mr. President, President Obama enters office with a huge amount of "hoopla" and an almost messianic belief that he can "heal the environment", fix the economy, and solve problems like global terrorism. Is some sort of reckoning certain? 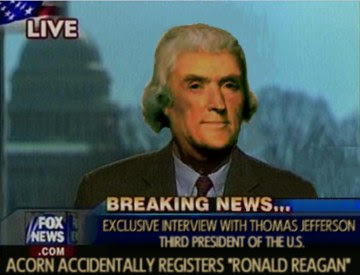 Jefferson: No man will ever carry out of the Presidency the reputation which carried him into it. Hannity: His immense, trillion-dollar "stimulus" package puts control of the people's money in the hands of a few central planners. What is your reaction to that strategy? Jefferson: Every government degenerates when trusted to the rulers of the people alone. The people themselves are its only safe depositories... I know of no safe depository of the ultimate powers of the society but the people themselves; and if we think them not enlightened enough to exercise their control with a wholesome discretion, the remedy is not to take it from them but to inform their discretion. Hannity: So you are generally opposed to a top-down stimulus package and prefer that the spending decisions reside with the people who pay taxes? Jefferson: I own that I am not a friend to a very energetic government. It is always oppressive. Hannity: What about Democrats' tendency to grow the size of government and intrude in every aspect of our lives... from the New Deal's entitlement programs, transportation, energy, health care, etc.? Jefferson: My reading of history convinces me that most bad government results from too much government. 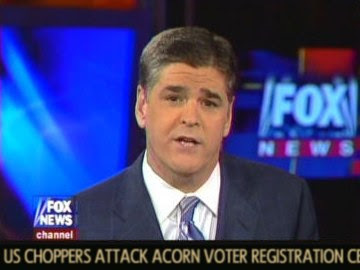 Hannity: And increasing taxes on the highest earners -- the "progressive" income tax? Jefferson: A wise and frugal government, which shall leave men free to regulate their own pursuits of industry and improvement, and shall not take from the mouth of labor and bread it has earned - this is the sum of good government. Hannity: How troubling is it that the amount of debt that the Federal Government is undertaking -- combined with entitlement programs that are massively underfunded -- means that we are passing huge amounts of debt to our children and grandchildren. Jefferson: It is incumbent on every generation to pay its own debts as it goes. A principle which if acted on would save one-half the wars of the world... Never spend your money before you have earned it. Hannity: What would you like to say to the those of our current leaders who are operating under ethical clouds: from Rangel, to Dodd, Murtha, Frank, Mollohan, Clinton, Geithner, Holder and Reid. Jefferson: Our country is now taking so steady a course as to show by what road it will pass to destruction, to wit: by consolidation of power first, and then corruption, its necessary consequence. Hannity: You've seen one of my "man-in-the-street" interviews, where we ask random people simple questions about current events, like 'who is the Vice President'? We found during the Obama campaign that many of those voting for him were completely uninformed and various surveys confirm that general ignorance about the man and his motives. Is that troubling? Jefferson: If a nation expects to be ignorant and free, in a state of civilization, it expects what never was and never will be. Hannity: Mr. President, what are your thoughts about President Obama basically ignoring Republican requests for a bi-partisanship approach to the stimulus package, stating "I won" and to get over themselves? Jefferson: Bear in mind this sacred principle, that though the will of the majority is in all cases to prevail, that will to be rightful must be reasonable; that the minority possess their equal rights, which equal law must protect, and to violate would be oppression. Hannity: The concept of welfare, where the state redistributes wealth to the poor even though many could easily work, has been statistically shown to increase single-parent families, a culture of dependency and crime. What are your thoughts on welfare? Jefferson: Dependence begets subservience and venality, suffocates the germ of virtue, and prepares fit tools for the designs of ambition. Hannity: Moving to the First Amendment: this concept of blogging, where anyone can be a well-read author or pundit, is a new innovation for politics. Do you believe that blogging is a useful tool to promote Democracy? Jefferson: Information is the currency of democracy... Educate and inform the whole mass of the people... They are the only sure reliance for the preservation of our liberty. Hannity: Interestingly enough, the whole newspaper business has suffered mightily with the rise of the Internet. Your reaction? Jefferson: I do not take a single newspaper, nor read one a month, and I feel myself infinitely the happier for it. Hannity: Regarding the Second Amendment, Barack Obama has historically opposed private ownership and possession of firearms. In fact, his home city of Chicago has onerous regulations that effectively prohibit guns altogether, yet the city has the highest number of murders per year of any state in the Union. Your thoughts? Jefferson: No man shall be debarred the use of arms... Every citizen should be a soldier. This was the case with the Greeks and Romans, and must be that of every free state. For a people who are free, and who mean to remain so, a well-organized and armed militia is their best security. Hannity: How do you respond to Democrats who have made a variety of moves to revive the ill-named "Fairness Doctrine", which threatens conservative free speech and which was already ruled unconstitutional once in our history? Jefferson: I have sworn upon the altar of God, eternal hostility against every form of tyranny over the mind of man... It behooves every man who values liberty of conscience for himself, to resist invasions of it in the case of others: or their case may, by change of circumstances, become his own. Hannity: Final question, sir. What about the Democrats' massive dependency programs, entitlement programs, and efforts to censor free speech such as the "Fairness Doctrine"? Doesn't this violate the principles of the Declaration of Independence and the Constitution? Jefferson: Experience hath shewn, that even under the best forms of government those entrusted with power have, in time, and by slow operations, perverted it into tyranny. Hannity: Thank you so much for your valuable time, Mr. President. Note: Every Jefferson response is verbatim as reported by BrainyQuote. If statements were made at separate times, they are separated by an ellipsis when combined into a single response. Fox News Ticker: Hijacked from from the brilliant People's Cube. Hannity lets a guest utter a complete sentence? Never happen. That's BILL O'REILLY not Hannity! haha, this is funny, nice job.